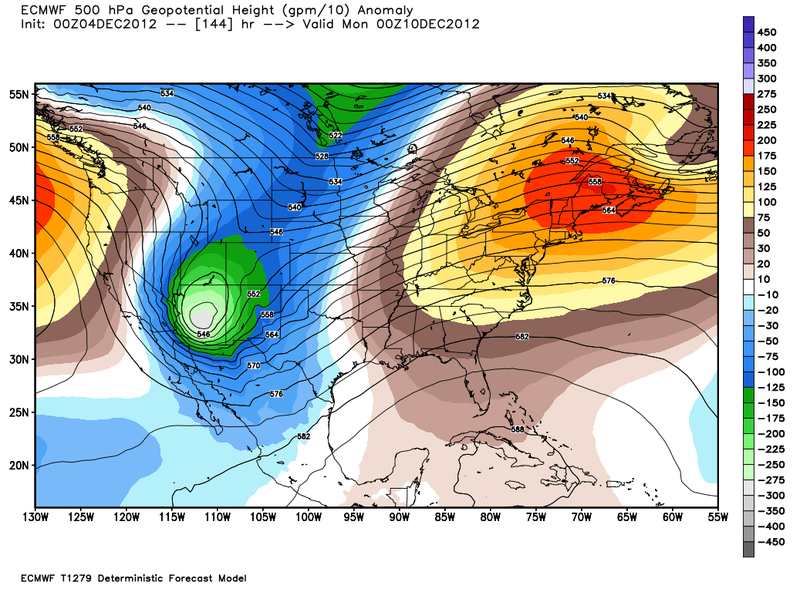 Prospects Of A Winter Storm Looking Better. Blog updated Wed Dec 5, 2012. Fiery December Sunset In Carlsbad, NM Sunday. Red Hills Gas Plant Sunset, 22 Miles West Of Jal, NM Tue. 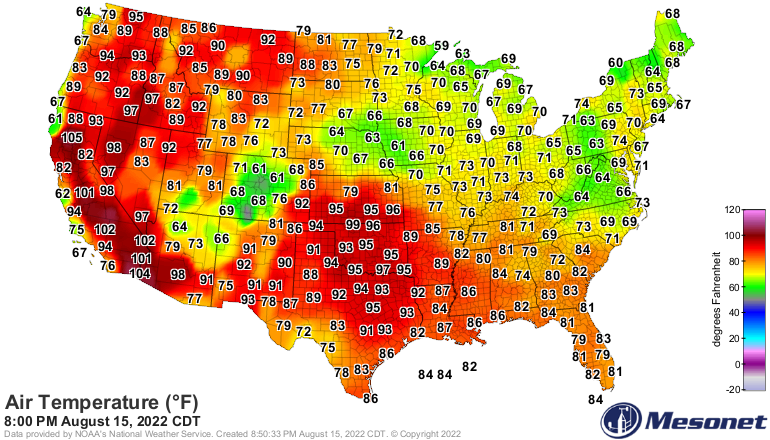 New Daily Record High Temps Set. 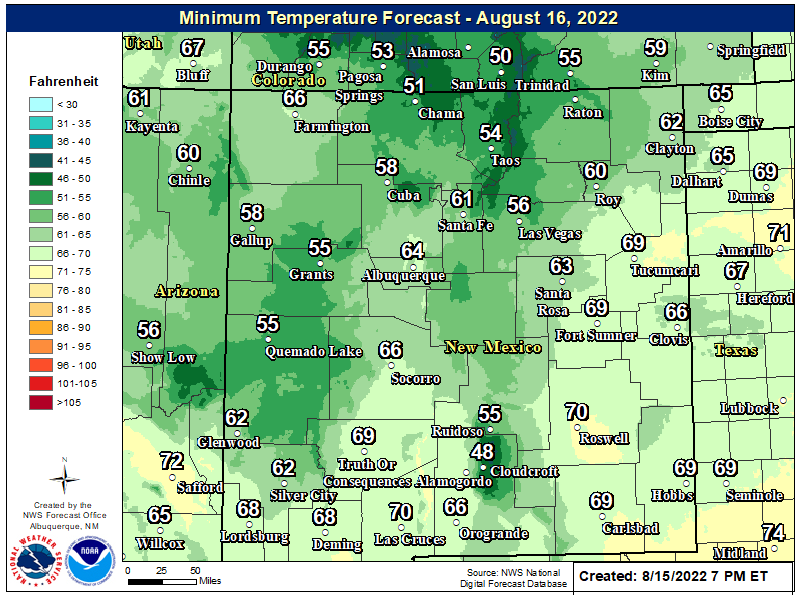 Today will be a little cooler across southeastern New Mexico behind a weak, and dry cold front passing through the area. 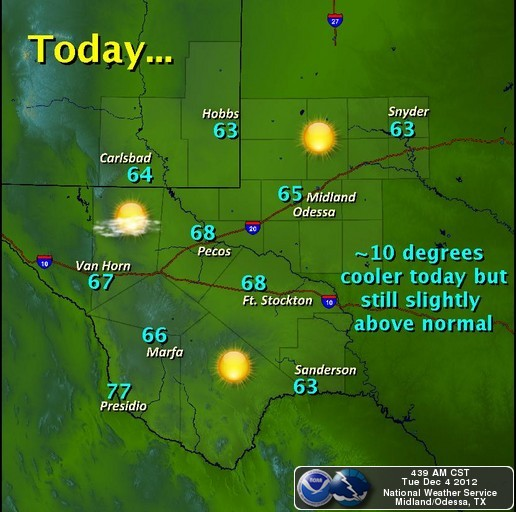 Our afternoon high temps today are forecast to range from near 60 to the low 60's. 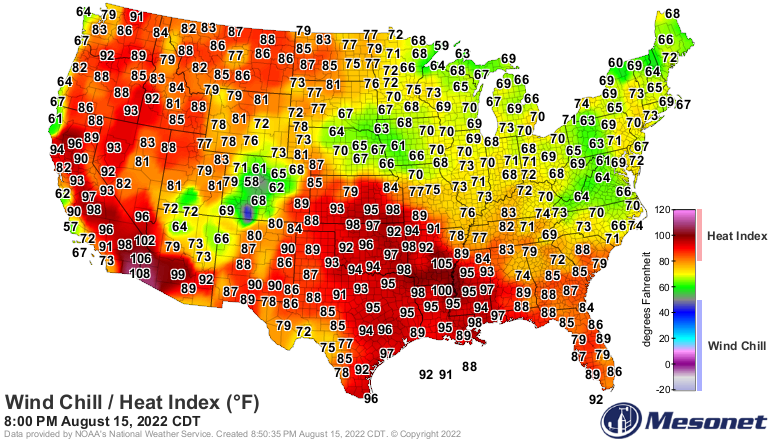 These readings will be close to seasonal averages for the date. Those of you who have become addicted to our balmy and tranquil weather over the past month are going to love the rest of the week. 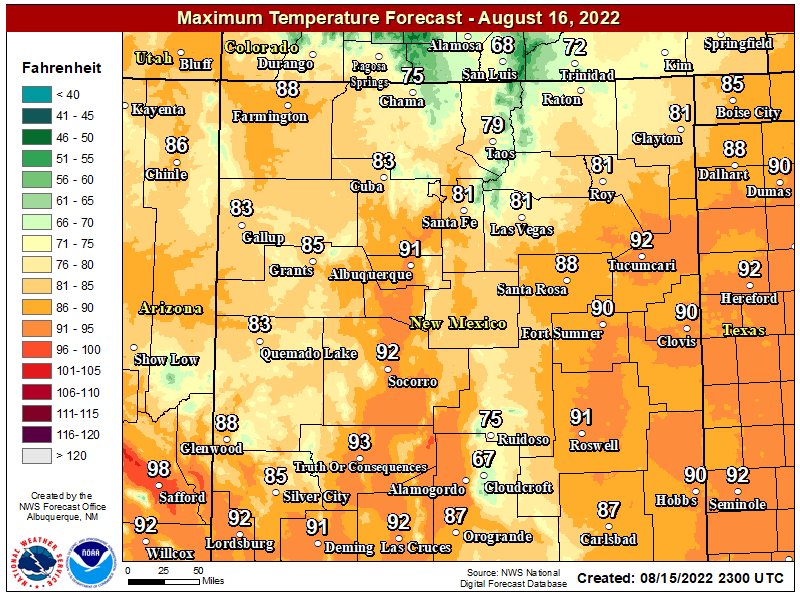 More above normal temperatures will return by Wednesday with afternoon highs in the low 70's expected. 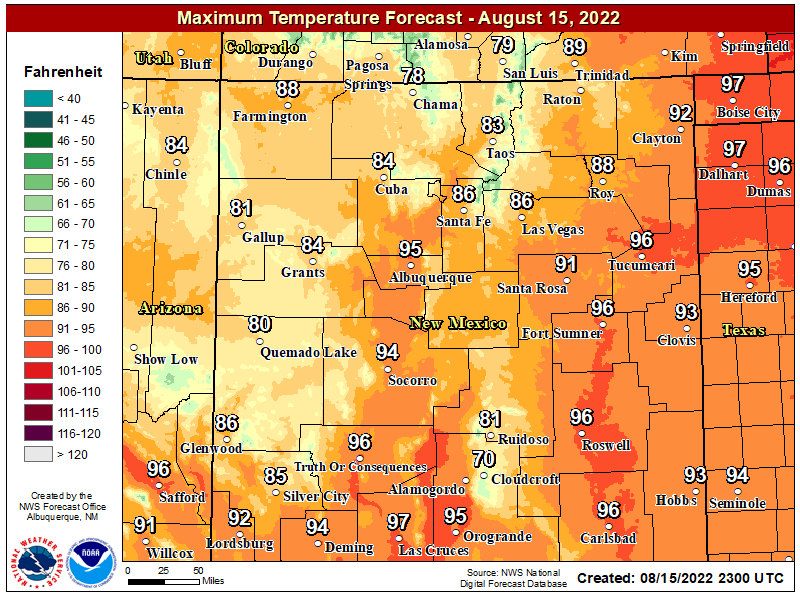 Thursday will likely be another day in which a few daily record high temps may be set with highs near 80 to the low 80's. Friday we are looking at the mid to upper 70's, and the low to mid 70's on Saturday. Sunday will see the upper 60's to the low 70's. Then the bottom falls out of the thermometer by Monday. Last Nights 00Z/5 PM MST ECMWF 500 MB Forecast. 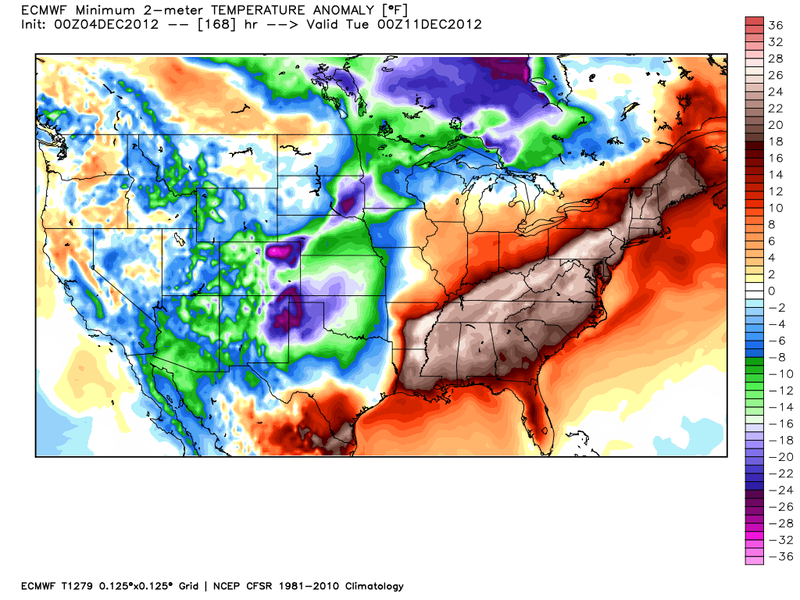 Valid At 5 PM MST Sunday December 9, 2012. 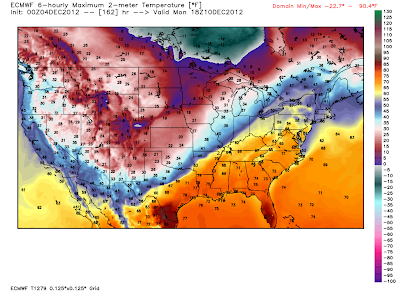 Last Nights 00Z/5 PM MST ECMWF Temp Forecast. Valid At 11 AM MST Monday December 10, 2012. 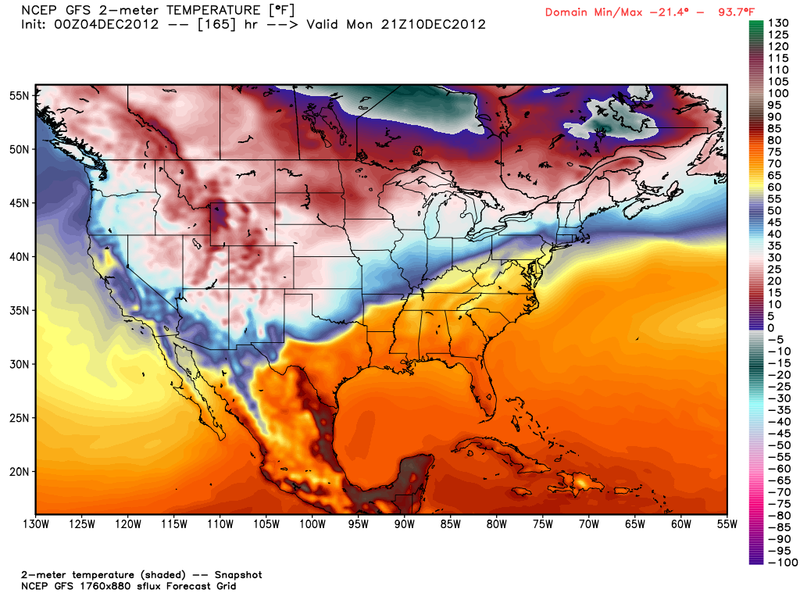 Last Nights 00Z/5 PM MST ECMWF Temp Anomaly Forecast. 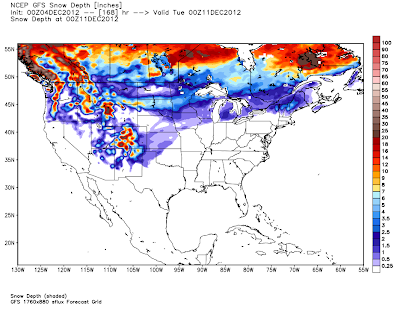 Valid At 5 PM MST Monday December 10, 2012. 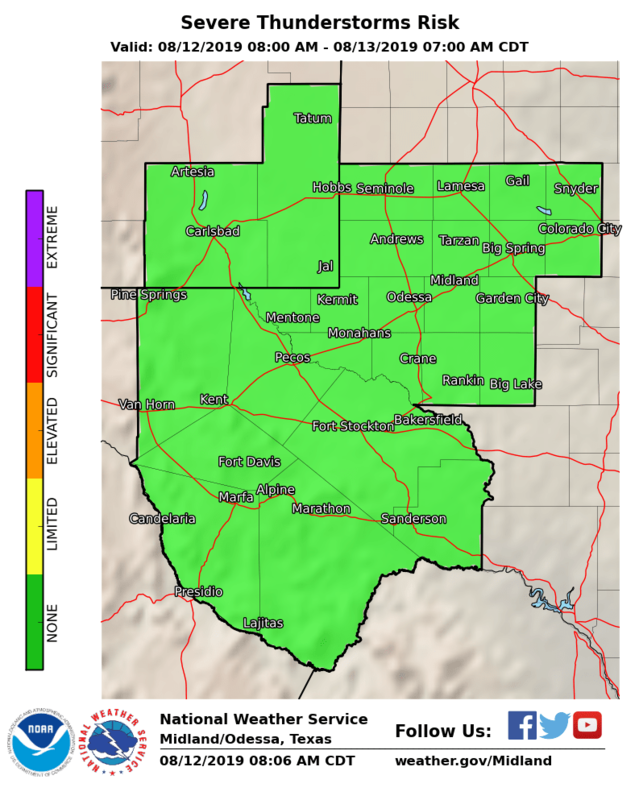 Last nights run of the European (ECMWF) forecast model has shifted much further to the north with the closed mid-upper level low on Sunday, placing it over central Arizona. This is also faster than the previous run which had the low over the Baja region on Monday. Much colder temps are headed our way by Monday, with readings struggling to reach the freezing mark by noontime on Monday. That is according to the ECMWF forecast anyway. Temperatures on Monday have the potential to be some 30-40 degrees colder than this weeks readings according to this model forecast. We may yet see some additional adjustments in the eventual forecast track of this potential winter storm over the Desert Southwest. So don't be surprised to see some additional changes in our local forecasts this week and weekend. 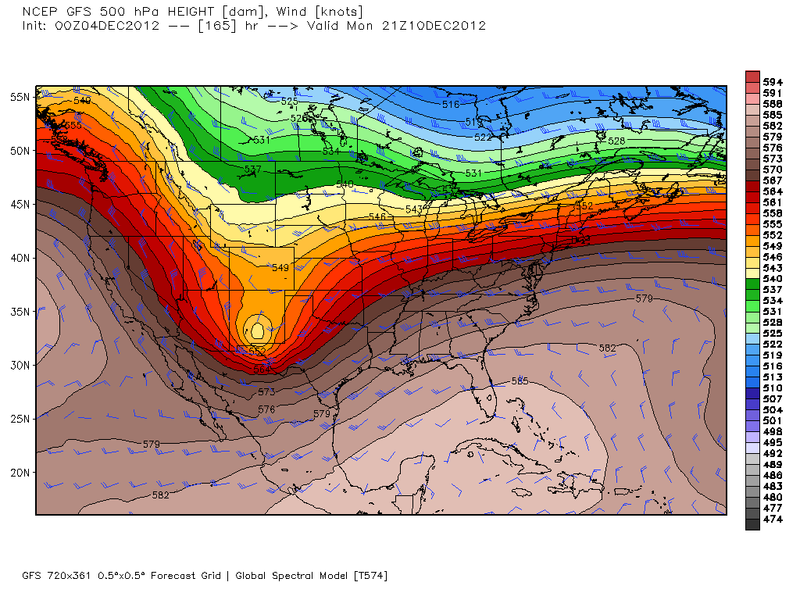 Last Nights 00Z/5 PM MST GFS 500 MB Forecast. 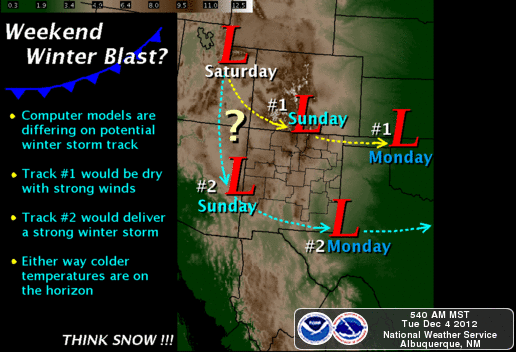 Valid At 2 PM MST Monday December 10, 2012. Last Nights 00Z/5 PM MST GFS Temp Forecast. 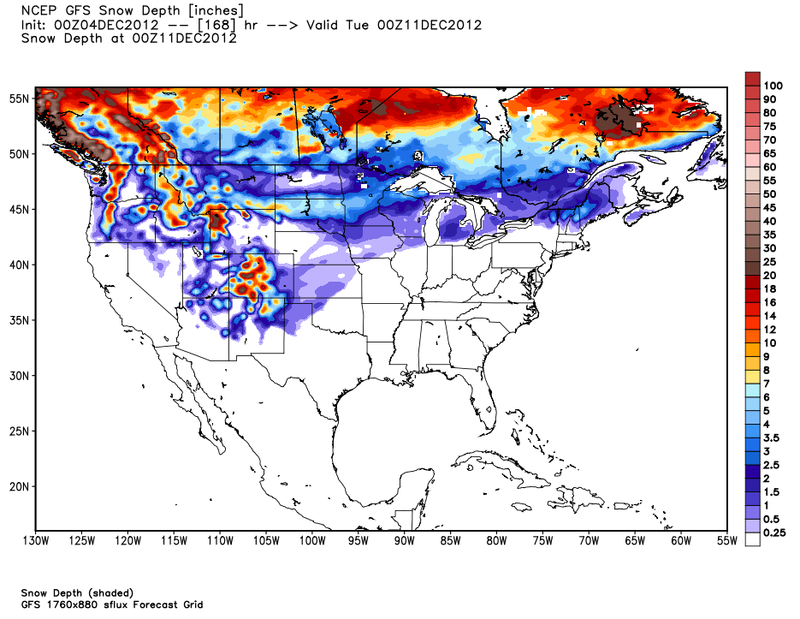 Last Nights 00Z/5 PM MST GFS Snow Depth Forecast. The GFS forecast model is a little further east, and faster with our potential winter storm Monday, than its previous forecasts have been indicating. 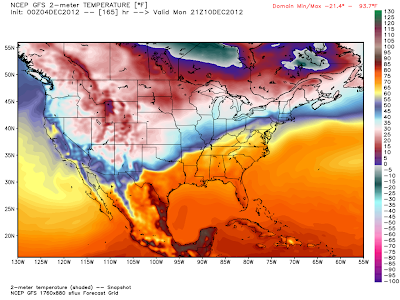 Its also not as cold as quickly as the ECMWF (on Monday) is forecasting. At this point in time its just too early to get too excited about the details of this pending winter storm. I'm a little leery of this eastward shift of the model forecasts concerning this storm. History tells us that the models will change their tune several times between now and Monday. 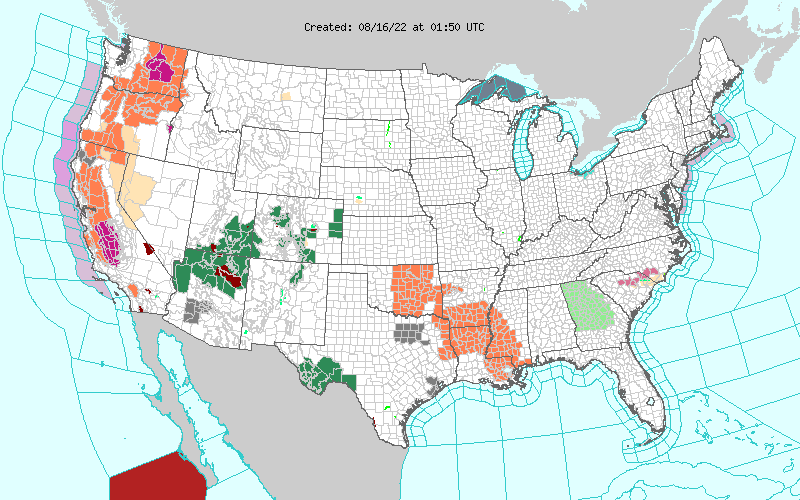 History also teaches us that digging storms coming this far south tend to be slow down, and dig further to the west than the models initially forecast. A slower and further west storm track, then a eventual storm track further to the south would be more favorable for snow across much of the state. It would also mean that the cold air would arrive a little later than what the models are currently forecasting. I doubt that the models will have a good handle on this storm until late this week or even the weekend. 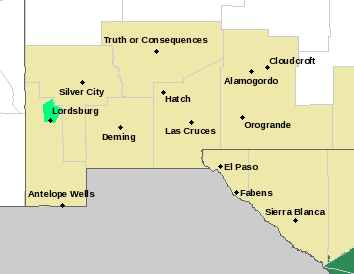 Whether or not we see snow fall here in southeastern New Mexico early next week is iffy at this point. But one thing is for sure, enjoy this weeks balmy spring-like temperatures because they are going away starting Monday. A pattern change is underway, with a trend towards colder and stormier weather starting next week. Break out those jackets and coats you will need them. 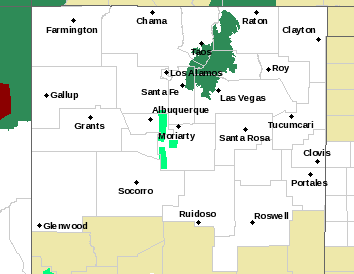 Great analysis...Abq media has the town hyped up (as usual), acting like it gets colder starting this Thurs. 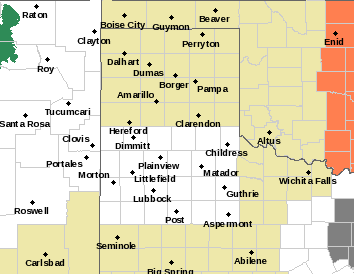 But I'm ready, but I grew up in Denver and college in OK...Abq's few bouts w/ winter are mostly child's play. Your "ECMWF Temp Anomaly Forecast" map is awesome...well, unless you live in Tucumcari or Denver!